Tonight: Lee Konitz @KenCen Terrace Theater was originally published on Black Plastic Bag on Nov. 21, 2009, at 3:18 p.m. Cool Jazz sax legend Lee Konitz stops by the Kennedy Center’s Terrace Theater tonight. In advance of his show, Washington City Paper talked to Konitz about his upcoming projects, working with the contemporary jazz trio Minsarah, and Alan Greenspan. Washington City Paper: How did you get hooked up with Minsarah? Lee Konitz: They invited me to play with them, someplace in Europe, and then to do a recording session. We all enjoyed that very much, and we recorded another record, a live record, at the Village Vanguard some months ago. WCP: The new record is surprisingly different from the studio album. LK: Well, the studio date was more prepared things. At the club was kind of a four-man jam session; we just played standards. 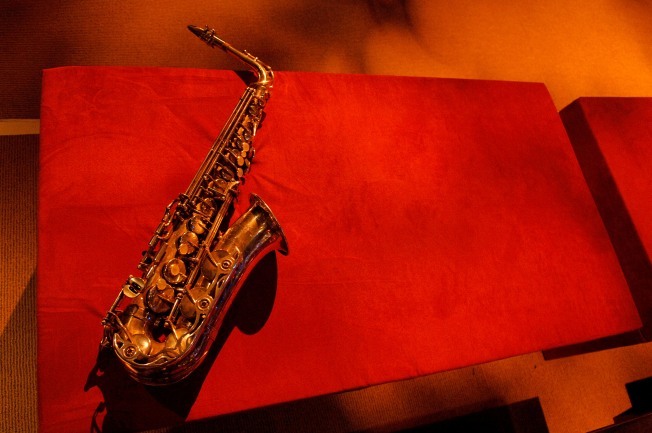 WCP: Are you playing with a different sax tone, too? Your sound seems more blunt. LK: I try to change the sound every time I play, as well as the order of the notes. I don’t know if you realize, but I play two different saxophones, and I use a washcloth in the bell quite a bit of the time. WCP: Now will you be doing the prepared compositions, or the jam session, when you play with Minsarah at the Kennedy Center? LK: We’re going to pick up where we left off. We’ll just be playing tunes. We take turns choosing and starting off with a tune, and I just ask that whoever’s doing it suggest the melody at the beginning so we know what we’re playing. WCP: So did Brad just not know “Stella by Starlight”? LK: Yeah, he knows it. I just didn’t play enough of the melody. That can be very confusing. So that’s what I’ll be doing at the Kennedy Center. We hope that Barack and Michelle, Joe Biden and Alan Greenspan, Leonard Garment and all those people will come in. But we know they won’t. WCP: Well, Alan Greenspan is known to be a jazz fan. LK: And Leonard Garment [Nixon’s personal attorney during Watergate] played for a couple years in Woody Herman’s band, as a substitute. And if I’m not mistaken, I think I went to high school with Alan Greenspan in Chicago. And I was also pleased to learn that Walter Cronkite, the great TV journalist who died recently, played the soprano sax! And of course we know about Bill Clinton. WCP: What’s special about playing with Minsarah? LK: Well, they are very interested in what each of them are doing, and what I’m doing. And they respond in some way. There’s nothing like communication where people are responding to each other. So I welcome that with open arms, any time that happens. WCP: And what other projects are you involved with right now? LK: Oh, I’m going to be playing in Europe with a pianist named Dan Tepfer, who I just did an album with, then joining Minsarah again for some concerts. Then in December I’ll be working with Charlie Haden, Brad Mehldau, and Paul Motian at Birdland, plus a stint with Ethan Iverson and Mark Turner. There’s also a young French saxophonist I’ll be working with, named Alexandre Gamil. I never thought I’d ever be playing six clubs in three months, but there it is. WCP: Well, surely being a legend helps with your bookings? LK: Yeah, well, they all want to get me now, while I’m still around. Lee Konitz and Minsarah perform tonight at 7:30 and 9:30 at the Kennedy Center Terrace Theater, 2700 F Street, NW , (202) 467-4600. $35.